After 14 years restoring this old Elizabethan house (dating from around the early 1500's) it is so exciting to see the rooms finally coming together! At times the work has been an 'uphill' struggle, but after all the long hours of toil, this 500 year old house is suddenly ready for the finishing touches that will make a home. 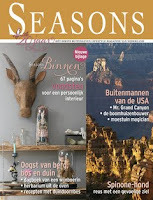 It is a complete joy to see fresh flowers, treasured photo's and possessions filling each room. 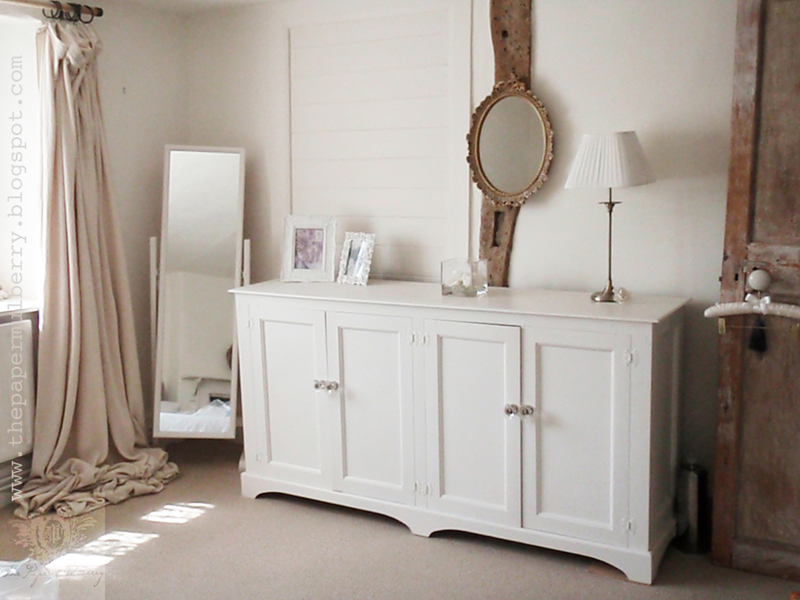 Here are a few pictures of one of the finished guest bedrooms and bathroom. 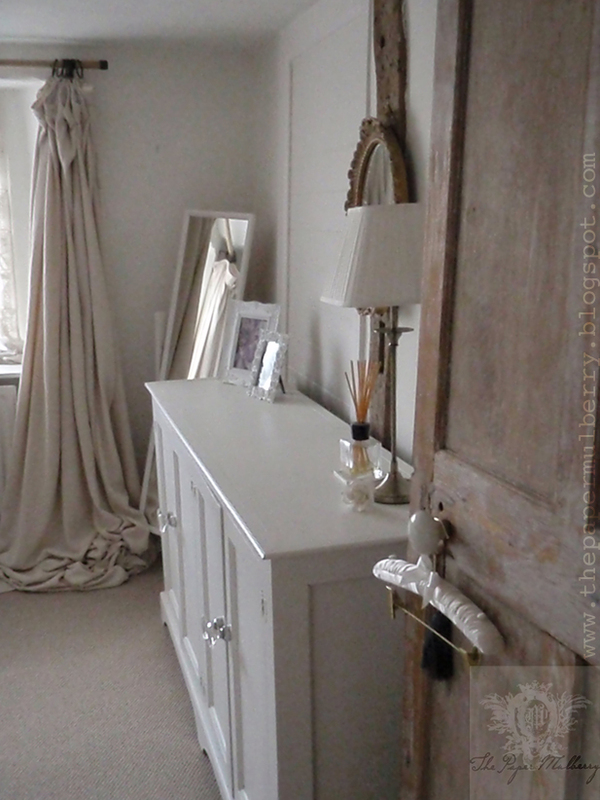 Above image: The Paper Mulberry - a guest bedroom: my Husband made the cabinet which is painted in Laura Ashley 'Ivory' eggshell glass door knobs also from Laura Ashley the wall mirror is vintage. 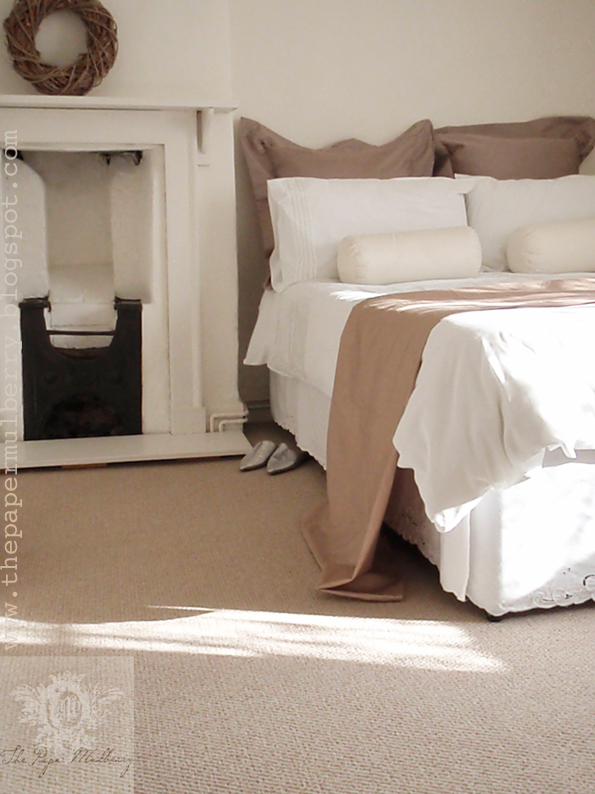 I had intended to shorten the curtains (made from unbleached loomstate cotton) but I loved the puddled drape! 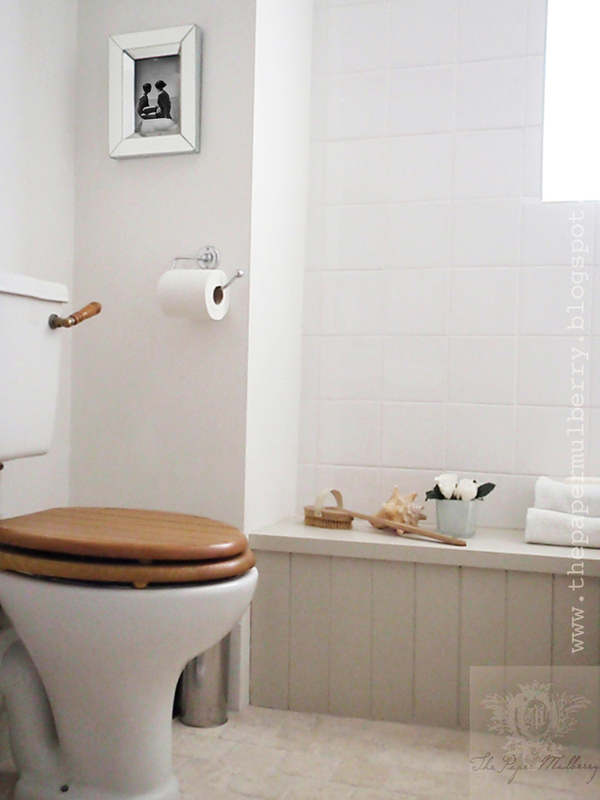 Above image: The Paper Mulberry - the bathroom: we tiled the bathroom with plain white gloss ceramic tiles on the walls with a white rustic, tumbled travertine marble floor and co-ordinating white tumbled travertine mosaic tiles on the plinth(which hides the plumbing!) 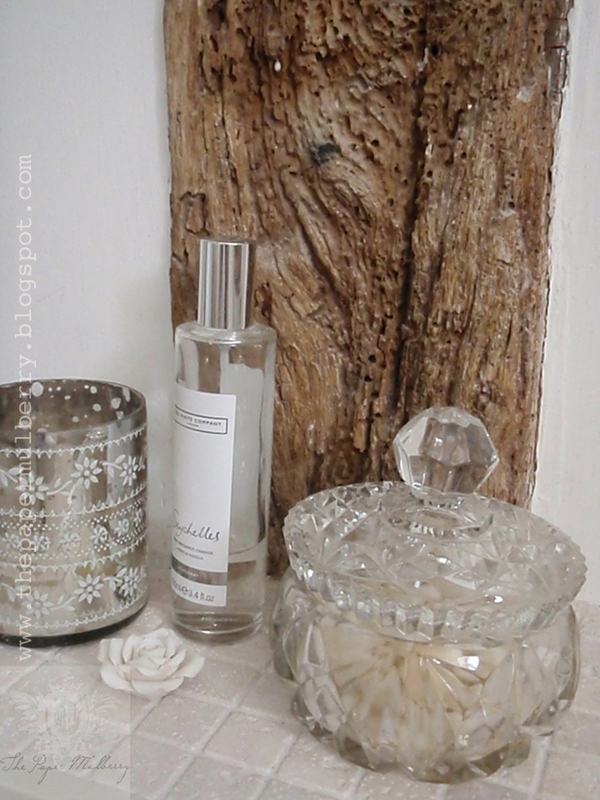 The vintage glass pot contains white stones fragranced with The White Company's 'Seychelles' oil which is one of my favourites! The porcelain rose also holds the fragrance oil. I'm pleased to say that the woodworm in the oak beam is now treated and gone!!! 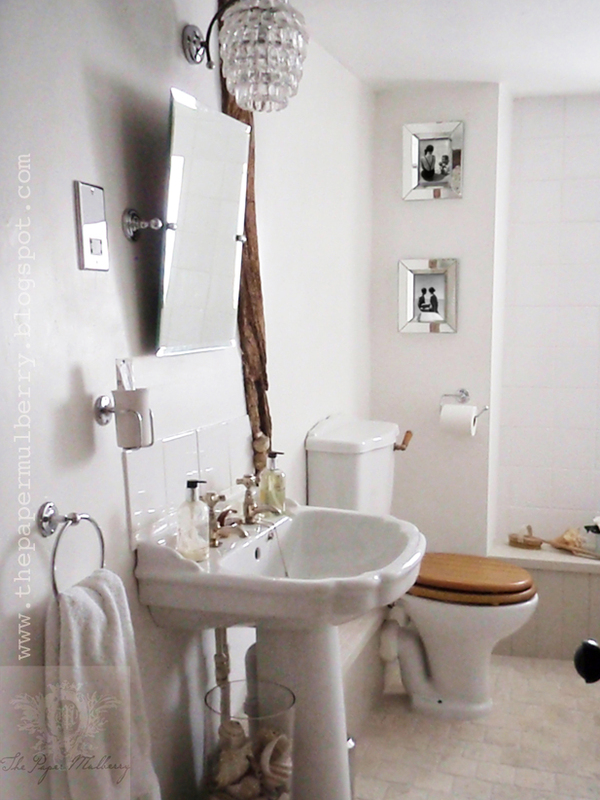 Above image: The Paper Mulberry - the bathroom: the tongue and grove panelling on the bath is painted in Farrow and Ball 'Stony Ground' shade 211 with the bench painted in Farrow and Ball 'Shaded White 201 The floors on this level are made from limecrete (a 1500's version of concrete) making it impossible to conceal any pipework. 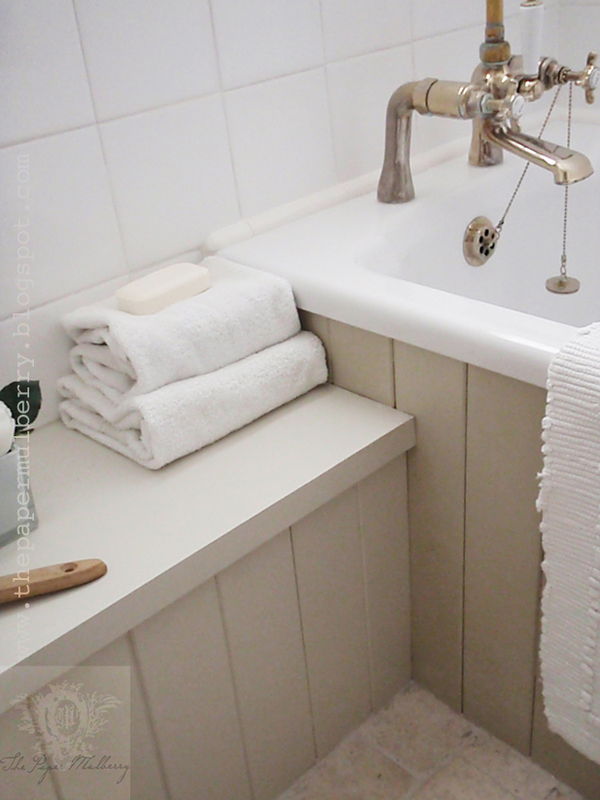 In the bathroom the pipes and waste for the bath, basin and toilet are concealed within the wood panelling. 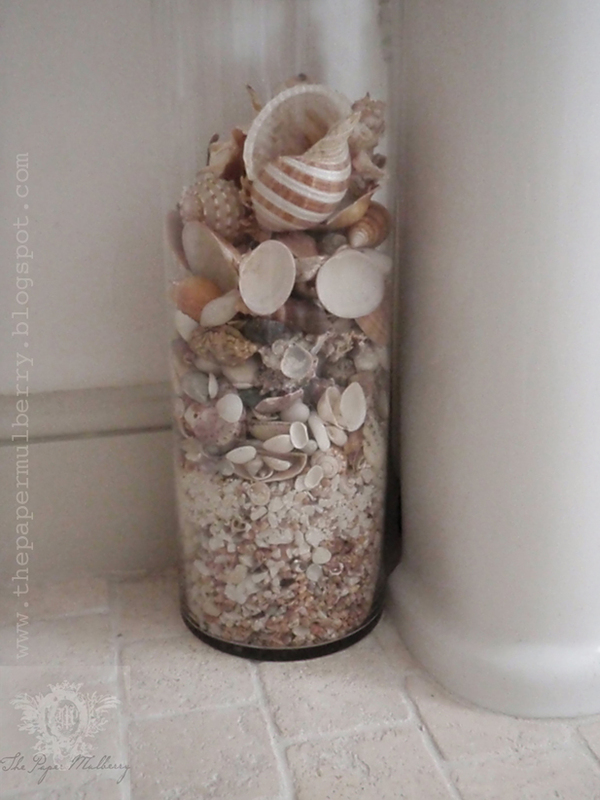 Above image: The Paper Mulberry - the bathroom: I filled a tall florists glass cylinder vase with seashells. 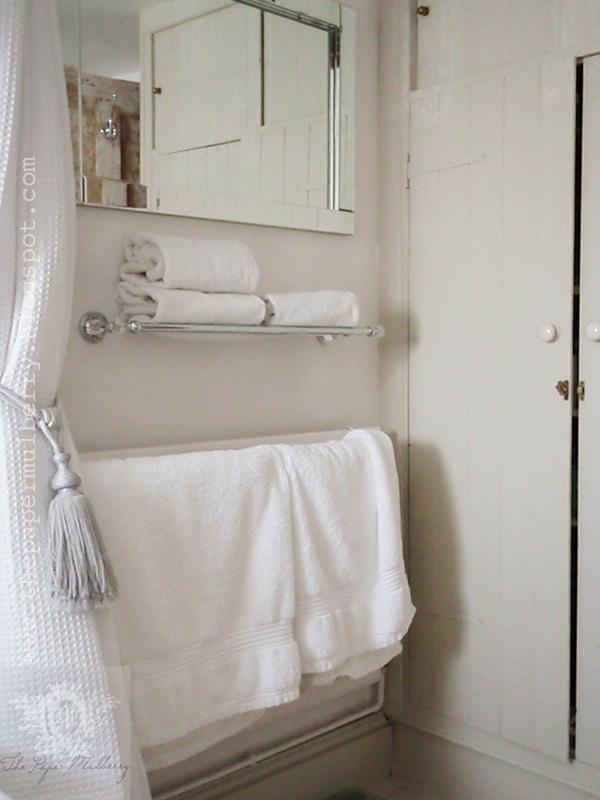 The floors are white rustic, tumbled travertine marble and the skirting board is painted in Farrow and Ball 'Shaded White 201 eggshell. 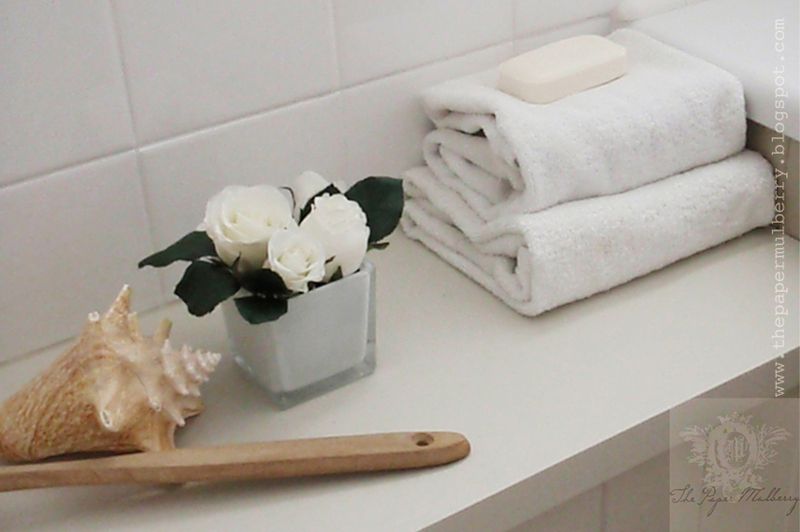 We tiled the bathroom ourselves to preserve the uneven floor and walls that we love so much! It took me quite a few hours to do the grouting and although it may not be perfect I do now appreciate the back braking work that professional tilers go through!